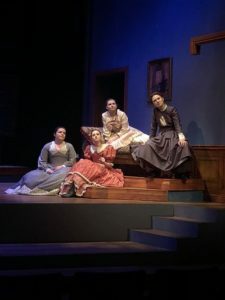 Louisa May Alcott probably kicked the dirt from her grave if she saw the recently abridged version of her classic vanilla story, “Little Women” that shaves the lengthy semi-autobiographical novel to an 80-minute comedy. 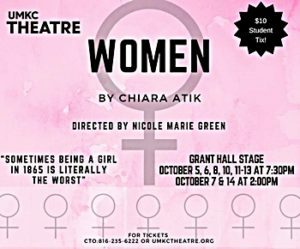 Director, Nicole Marie Green found the play “Women” by Chiara Atik and used it to cast many of UMKC undergraduate thespians in the outlandish piece that takes massive liberties with the Alcott memoir. Aunt March, the closest most stuffy of the characters does not appear in “Women”; father remains out of the picture at war; Marmie somehow raises the four girls with does so with no apparent income; and (spoiler alert) Beth still dies. The new version moves along at a rapid pace, unlike the book, with the characters in their 1800’s garb but speaking in modern language, rapidly and half-way lampooning the melodramatic original story. Meg wants to marry and pop out babies in rapid fashion, though only God, in His infinite wisdom knows how her husband earns a wage. Beth dies. Jo writes plays and stories and shows no interest in men (other than looking as manish as possible in her clothing choices). Amy, the spoiled brat of the group, only paints and pursues artistic pleasures. The show is fun and the updated, stripped down version keeps the audience laughing. But, be assured, those lined would fall flat in not for the fun delivery of the young cast that bring them to life. 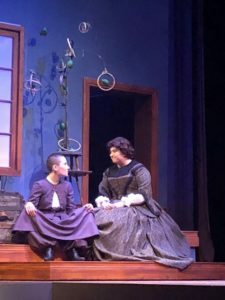 The story gives little for the characters to develop as they are mostly one-dimensional and flat, but with some twists, turns, and delivery, the characters spring to live for audiences. 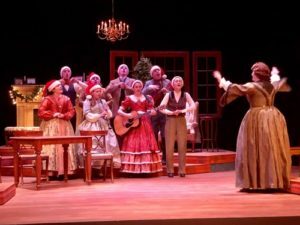 For this fractured lampoon of “Little Women,” Green selected a strong cast and gave them the tricks to serve up comedy through intonation, movement, facial expressions, and rapid delivery. The cast is: Hannah Woolsey as Jo, Taylor Nell as Meg, Hayley Solowy as Beth, Amy King as Amy, Catherine Cannon as Marmee, Alex Richie as Laurie, Jack Kneessy as Mr. Brooks, Joshua Woodall as Baher, Frederick Rivera as Mr. Lawrence/Clovis/Carl. The production team is: Nicole Marie Green, director; Malcolm Gibbs, assistant director; Selena Gonzales-Lopez, scenic designer; Matthew Short, sound designer and original music composer; Sadie DeSantis, production manager; Brandy Giordano, costume design; Caroline Jackson, stage manager; Zach Kuhl, technical director; Lee Barker, TJ Toribio, properties managers; Zan de Speilder, master electrician; Kate Winegarden, Kelli Harrod, Sarah Reed, scenic charge artists; Emma Davis, light board programmer; Matthew Short, sound design; Conner Johnston, light board operator; Ethan Baltz, sound board operator; Jeanette Delaney, stage crew/wardrobe; Michela Crawford, Colin Fowler, ushers.